"Amazing Grace How Sweet The Sound". Stitch on the enclosed aida fabric. Design size: 6.25" x 7.25" (15.9 cm x 18.4 cm). 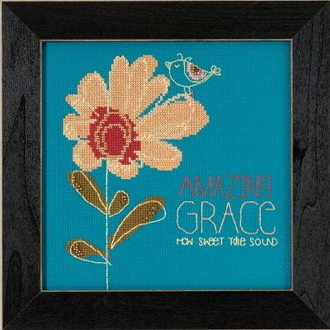 Mill Hill Glass Beads, 14 count Aida Fabric, floss, needles and chart with instructions. Frame sold separately, see item 40-156 Matte Black frame (GBFRM21).